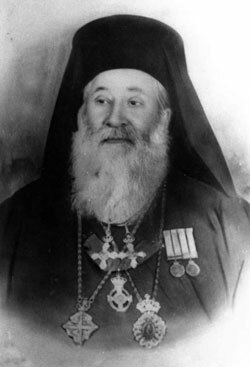 On 23 March 1943, when the expulsion of Jews from Thessaloniki to Auschwitz began, Archbishop Thophilos Damaskinos of Athens and all Greece published an outspoken condemnation of the deportation of Greece’s Jews. "I have taken up my cross," Demaskinos proclaimed. "I spoke to the Lord, and made up my mind to save as many Jewish souls as possible." On 9 September 1943, a German force landed on the island of Zakinthos (Zakynthos). The German commander ordered the Greek mayor Carrer to provide him with a list of the local Jews, so that they could be deported to the mainland and from there to the camps in Poland. The mayor went to the local church leader, Metropolitan Dimitrios Chrysostomos for assistance. Following his church's leader, Chrysostomos volunteered to negotiate with the Germans and told Carrer to burn the list of the island’s 275 Jews. He then approached the German commander and implored him not to deport the Jews. The Jews were Greek citizens, he argued. They had done no harm to their neighbors and did not deserve to be punished by deportation. When the German would not listen and insisted upon receiving the list of all the local Jews, Chrysostomos took a piece of paper, wrote his own name on it and handed it over. "Here is the list of Jews you require," he said. The Metropolitan and the mayor then went to warn the Jews of the imminent danger, urging them to go into hiding in the mountains. Most of the island’s Jews survived the Holocaust. In 1948, in recognition of the rescue of the community during the Holocaust, the Jewish community donated stained glass for the windows of the island’s Church of Saint Dionyssios. On January 1, 1978, Yad Vashem recognized Dimitrios Chrysostomos as Righteous Among the Nations.